These volumes draw together documents found in the British National Archives to trace the origins and development of the Zionist movement in the 19th and 20th centuries, with specific reference to the goal of establishing a Jewish homeland. Volume 1 is historical, covering the rise of Zionism, the work of Theodor Herzl and the first Zionist Congress at Basle, ending with the fall of the Ottoman Empire. Volumes 2 to 9 relate to the years 1916-1948 when the Zionist debate raged, the movement became factionalised, split, and eventually achieved its goal of the creation of Israel. 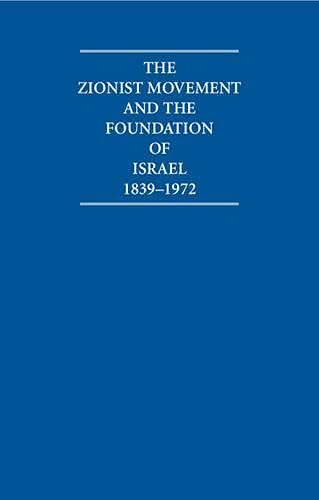 Volume 10 ranges over a greater number of years in less detail, covering the period after the creation of Israel in 1948 to the most recent releases by the British government from 1972, when the main question for Zionism, perhaps, was whether it still had a role to play beyond the inception of the State. These volumes draw together documents found in the British National Archives to trace the origins and development of the Zionist movement in the 19th and 20th centuries, with specific reference to the goal of establishing a Jewish homeland.